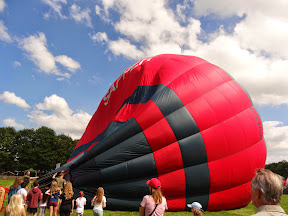 On Saturday last we drove over to the little village of Hermitage in Berkshire for the Reunion and Open Day of the Royal Engineers Military Survey (Geographical) Association. Many veterans of Military Survey and their families attended the event. In 1955, when Hermitage housed The School of Military Survey, I was posted there for training as a cartographer during my two years of National Service. Much has changed since then - especially with the introduction of computers. In my day, when drawing maps in Singapore for the Malayan Emergency, everything was done by hand - even the tiniest lettering. That is, until Letraset was invented and we could actually stick down pre-made lettering. We still had to hand draw all the symbols needed for the maps in that part of the world, such as jungle, rubber plantations, swamp and lallang. It's vastly different today with maps being produced at almost the speed of light. 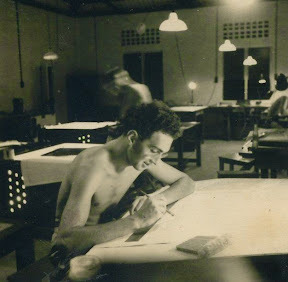 This is the way we worked then - and here I am slaving over a map while working in the heat of the tropics on night shift. Back to the day. As the Royal Engineers are compiling a visual history of what is now called The Military Survey (Geographical) Branch of the Royal Engineers, I took along twenty or so photographs taken during my time in the Regiment. 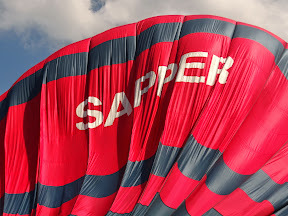 A Sapper is the name given to soldiers in the Royal Engineers, and as my young friend and I watched a number of soldiers attempting to raise an enormous hot air balloon this was revealed as the balloon started to rise. (But it never reached full inflation). 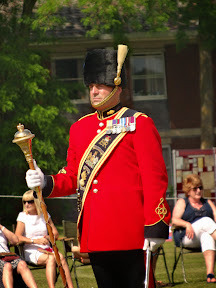 This extremely smart soldier - I think he was the Regimental Sergeant Major - remained rigidly still throughout the band's performance. 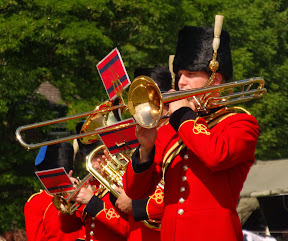 He only moved when he ordered the assembled band to march away. What a lovely day it was. Tinged with nostalgia for me, but a fitting farewell to Hermitage. My young friend's garden is having a complete makeover. She has a brand new house and this was the garden when she moved in. As you can see it is built on a rather severe slope. (Very difficult to mow the lawn). So the idea was to level about three quarters of the garden, make a raised area and build a path and create several borders for plants and small trees. The telegraph pole at the end of the garden will eventually become a design feature, but initially she had the boring and unlovely ginkgo tree removed. 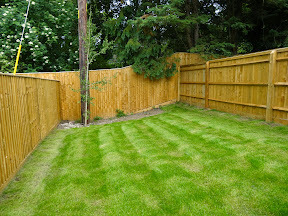 Hiring a very knowledgeable - and strong - gardener, the first few weeks were spent moving tons of earth from one side to the other in order to eventually create a small, and horizontal, lawn. 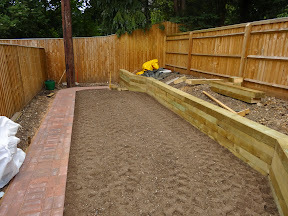 This shows the garden as it looked last week - most of the sleepers in place to create the raised bed, all the below ground drainage work completed, and the foundation of the path ready for brick paving. Still a way to go. 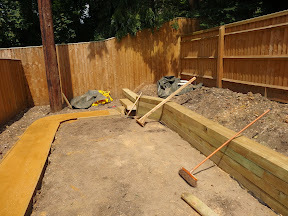 At the far end, in the top corner, an area of wooden decking will be created. My young friend has decided to call it her "sun deck" and to have a pergola erected over it. 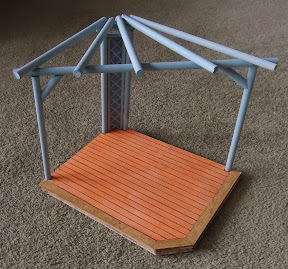 To help out I made this little model yesterday based on her idea of the type of pergola she wants. The perspective of this photograph gives a distorted view, nevertheless shows the sort of design she'll have made. And it will be the same blue colour we painted the shed the other week. 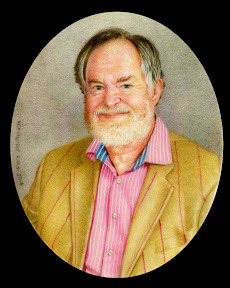 Apart from making little models and prising my fingers apart after a few battles with super-glue, I did manage to complete this miniature portrait of Richard Law last week. He and his wife are collectors so it was nice to be commissioned and to know that my portrait will hang alongside the others.